This came out in 1997 – really? – thirteen years ago! Wow. It genuinely doesn’t seem that long ago. 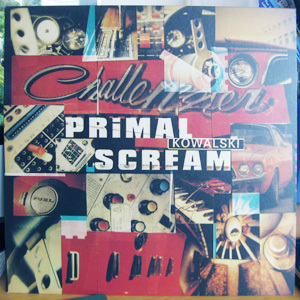 For me, ‘Kowalski’ and the Vanishing Point album from which it was taken are pretty much the high point in what’s been an amazingly long career for Primal Scream. At this stage, they were at the apex of messed-up coolness, and injecting a lot of weird, experimental stuff into what remained some very accessible music. Around the time of these records coming out, or shortly after, I saw Primal Screaam play at Brixton Academy. It was outstanding. Asian Dub Foundation supported, and did a largely instruments/backing track-free set that didn’t kick off until around midnight. Primal Scream, as they say, ‘tore the roof off,’ with a set that featured My Bloody Valentine’s Kevin Shields on guitar, along with guests including Depeche Mode’s Dave Gahan and (I think) Paul Simonon of The Clash. They were playing a lot of stuff that would later form the Xtrmntr album. It was a late night, and it was busy, and I got separated from the friends with whom I’d gone to the gig. Leaving the venue at around 3.30 am or so, worse for wear, I decided to wander the Brixton streets to find a taxi, before hopping into an unmarked car and drunkenly guiding it back to where I was staying in London. My friends weren’t there, and didn’t return for a couple of hours, during which time I slept peacefully on their front steps. Looking back, there’s many reasons why I shouldn’t really have survived that evening without more incidents or injuries. Luck was on my side. My sister, who is a few years older than I, went to University in Norwich. Knowing that I was a music fan, she used to tell me, now and then, about what was going on musically in Norwich. 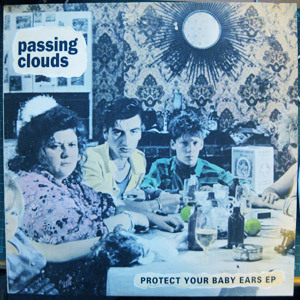 Sometimes these stories would involve a band called Passing Clouds, a member of whom was friends with one of my sister’s friends. They seemed to be a big musical fish in the small Norfolkian pond, and I was quietly impressed by this ‘friend-by-proxy’ connection with someone almost an Actual Real Musician. As this was a pre-internet-taking-over-the-world, let’s-go-indie-pop-through-the-mail kind of time, somehow I came across the postal address for Grant Madden, the aforementioned musician – and Passing Clouds vocalist. Ostensibly to ask if the band might like to contribute to one of the cassette compilations that I was releasing at the time, I dropped him a line. I can’t honestly remember if this led to the band actually being on one of my releases – such information is not on the internet; maybe I should put it there? 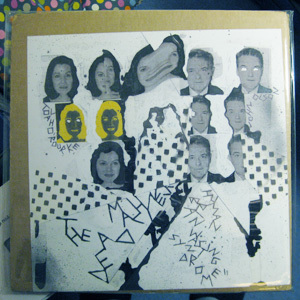 – but it did result in getting copies of this record and another 12″ by the band. And they were free! And they were, and still are, very good! Grant Madden moved on to form a band called Half Time Oranges, who released an album called Clive Baker Set Fire To Me, a title that has some kind of humorous football-related meaning, which is completely lost on me. That album was released by Rutland Records – named after Britain’s smallest county, which is a very indie-pop-twee kind of name – and that label also released records by Po! and The Cudgels, both of whom were on some of the compilations that I released. And so the circles-within-circles nature of that indie-pop scene is reinforced once again. Love this sleeve – two thick squares of corrugated cardboard housing the record, with a couple of colour printed inserts forming the front and back imagery. The weirdo, distorted style, and freaked-out geometry of the typography, may remind you of some of Wolf Eyes’ artwork, and there’s a reason for that. The Dead Machines are (or were) Wolf Eyes’ John Olson – who provided the artwork for this and many Wolf Eyes releases – and Tovah O’Rourke of Wooden Wand & The Vanishing Voice. A right old US-folk-noise-underground love-in, then. I imagine that this release is some kind of limited edition, based not only on its somewhat hand-assembled artwork but also because it’s out on Ecstatic Peace! Records. Not so much these days, but certainly a few years ago and beforehand, that label were infuriatingly confusing in their release ‘strategy’ – one of those labels that it’s very tricky to comprehend in terms of their entire roster or release list, because of semi-random catalogue numbers and a (perhaps intentional) shadowy nature in terms of self-promotion and marketing. Not that there’s anything wrong with that. They are not, after all, Universal Music Group. Ecstatic Peace! Records (that exclamation mark is annoying; it makes it seem like the sentence is over almost before it’s begun) was started by Thurston Moore of Sonic Youth in, I think, the very early 1980s. I have a cassette tape that may be their first release – as I said, it’s hard to tell – a spoken word double-sider featuring Lydia Lunch and Michael Gira. I don’t know if Moore is still involved in the running of the label – y’know, what with being an international mega-indie-hipster and all – but he’s certainly involved in as much as a lot of his own work coming out through it. If he is still involved, congratulations to him – in my (limited) experience, running a record label is a lot harder work than it might seem, if you try to do it properly. Ecstatic Peace! are nudging up on their 25th anniversary, which is pretty significant. I’d love to tell you how many releases that means they’ve put out – but, well, you know, I can’t. I’m not sure that even they could. 1997, the year of Tony Blair’s Labour Party victory in the general election… and the year of release of this single. Some kind of political statement is being made, perhaps, with the cover art (unless it’s just a sly interpretation of the artist’s name). Tony and Cherie, eating a tasty burger, Tony wearing a tie patterned with the American flag. On the back, Bill and Hillary Clinton, Bill sporting a Union Jack bowtie, Hillary with a half-drunk pint of bitter. What does it mean? Something, I’m sure. The cross-pollination of ideas between the UK and the USA, or something more cynical. Who knows? I know who knows. The guy that did the cover art. That guy is, in fact, also the guy that released this record. I think his name was Jon, but at this point, honestly I can’t remember. Let’s just assume that Jon was (and indeed is) his name. I met Jon at a fanzine convention that was part of the 1997 Sound City event that took place in Oxford. I lived in Reading at the time, and met up with a fellow fanzine writer named Kim to visit the convention. Jon was a nice fellow, we had a good chat, and I was very impressed by his illustrations – as I recall, this record wasn’t out at the time, but he had available a selection of his fanzines that all sported examples of his fine illustrative (and typographic) style. At the time, I was running my fanzine Circle Sky and asked Jon if he’d contribute some illustrations to a future edition. He agreed. Good stuff. Now, remember, this was pre-internet for the most part, and in hindsight I’m pleased and impressed that it led to a postal ‘conversation’ that ended up with my receiving two excellent original ink-on-paper illustrations of Primal Scream and Mogwai, to go with articles on those bands that I was running in the fanzine. I still have them somewhere. I should dig them out. Useful information: Now, at the time of writing, it’s obviously not pre-internet, so I can link to this. It’s diskant’s ‘Mogwai Artzine’ from 1998, to which Jon – as I can now confirm his name to be – contributed a (different) Mogwai illustration. You can see it here. It’s good, isn’t it? I also contributed to the Artzine, as did several other people – some of whom I still know, some of whom I don’t. It’s nice that stuff like this got put together and published, I think.